What do you get when you put these 7 little pieces of crochet together? They aren't usually blue, but sometimes they are. I figured out the pattern for this guy a few days ago because I needed blue lobsters to go with my latest doll - a New England fisherman. For this pattern you can either stuff your pincushions with fiberfill or use the pattern to "cover" an existing tomato and strawberry pincushion made by Dritz. The advantage of covering a Dritz pincushion is that the Dritz version has sawdust in the tomato (giving the pincushion a nice weight) and emery in the strawberry (to sharpen your pins!!). The Dritz pincushion costs around $1.50 and can be purchased online or at your local fabric store. I LOVE the way this pincushion turned out. In fact, I made another one for myself last night. NOTE: A couple of people have written to me asking how to do the "magic ring" to start the project. Here is a link to one of Planet June's blog entries that has directions and step by step photos to teach you how to make a magic ring. Of course, if you prefer, you can always start the project the traditional way of chaining 2, then making 6 sc (or however many sc you need) in the second chain from the hook. I made this scarf for my lovely niece Sophie for Christmas last year. I posted photos of her scarf on Flickr and Ravelry and I've received a lot of requests for the pattern. I learned this scarf-making technique from Susan Mills at a knitting and yoga retreat on Monhegan Island last fall. 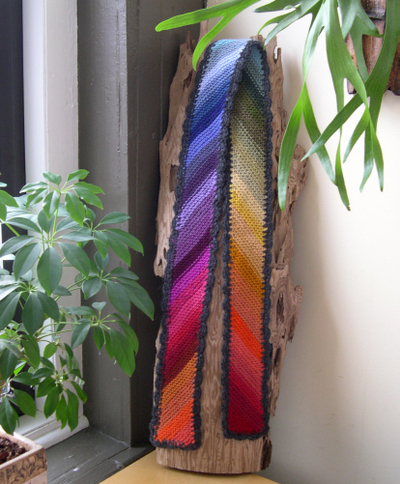 Over the weekend I managed to write out the directions so that you can make this scarf too! This is an easy and fun knit, and a great way to use up those shorter bits of yarn left over from other projects. Hope you enjoy making the scarf! I plan to make another one for myself sometime soon. 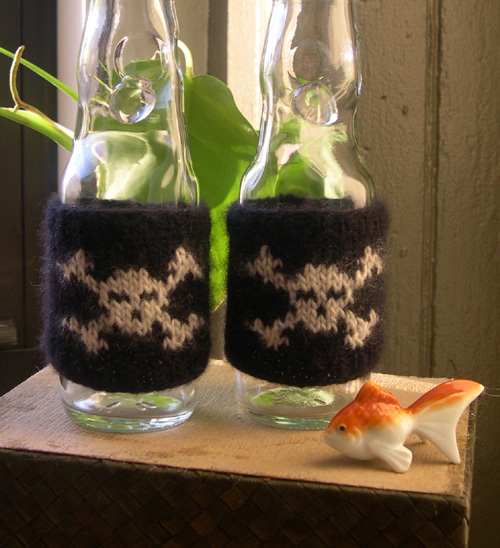 A few years ago I wrote my first knitting pattern - a pattern for a pair of skull & crossbones wristwarmers for my friend Martha. I posted a picture on the Skull-a-Day blog and started selling the pattern for a small fee on Etsy (donating all profits to KittyKind) and giving the pattern away to anyone who wrote to me. So far I've sold or given away many many patterns to many many nice people! Now that I have a blog, you can download the pattern directly. UPDATE: FOR EXAMPLES OF HOW OTHERS HAVE USED THIS PATTERN CLICK HERE.